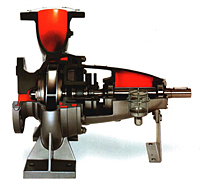 General:The DICKOW-Standard HTM-pumps, series NKLs according to EN 733, are designed as centrifugal pumps of light duty for handling heat transfer media. such that best efficiency is granted at all service conditions. The NKLs-HTM pumps will be applied as circula ting pumps in industrial heating plants. The performance range covers capacities up to 400 nf/h and differential heads up to 90 mLC in 50 cycles service.